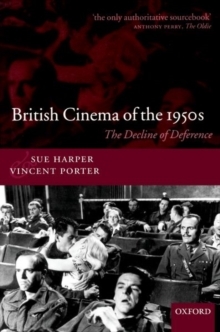 In this definitive and long-awaited history of 1950s British cinema, Sue Harper and Vincent Porter draw extensively on previously unknown archive material to chart the growing rejection of post-war deference by both film-makers and cinema audiences. Competition from television and successive changes in government policy all forced the production industry to become more market-sensitive. The films produced by Rank and Ealing, many of which harked back to wartimestructures of feeling, were challenged by those backed by Anglo-Amalgamated and Hammer. The latter knew how to address the rebellious feelings and growing sexual discontents of a new generation of consumers. Even the British Board of Film Censors had to adopt a more liberal attitude. The collapse of thestudio system also meant that the screenwriters and the art directors had to cede creative control to a new generation of independent producers and film directors. Harper and Porter explore the effects of these social, cultural, industrial, and economic changes on 1950s British cinema.